If you think the Volvo 1800ES was alone in the segment of Northern European shooting brakes from the early 70s, you would be mistaken. A little company called Jensen Motors built the Jensen-Healey convertible starting in 1972, but added a hardtop in 1974 to create the Jensen GT. Find this 1976 Jensen GT currently bidding here on eBay for $7,100 buy-it-now with 1 day to go, located in Florence, Oregon. Tip from Roy F.
The Jensen GT was released just before Jensen went into receivership (the British equivalent of bankruptcy) and 509 examples were built in 1975 and 1976. It is exceedingly rare to be seen on these shores, and the asking price seems very reasonable even when you consider the rust & electrical issues inherent to any Jensen. I really like the look of these! Too bad the bumpers look like parking lot dividers. Not sure if there is anything else to replace them with! I wonder what it handles like. It'll be interesting to see what it sells for. The "wall sized" wiring diagram maybe an omen! Actually, to be perfectly honest, it's inconvenient locale I should tally as a positive in "Doctordel's Decision Ledger of Doom" (or "An unusual proof of karma and a microexample of entropy as defined by several questionable purchases by an otherwise sane human being"). Someone once told us in med school that all the good diseases were already named; if I had the patience to study and identify whatever nefarious protein is responsible for my predeliction for long roofs and two doors I would gain no noteriety, to be sure. I bet it's a prion, actually. I would name it K2. Or maybe KBZ. And in the "funny without any knowledge of why, bless his heart" category, the seller paints Jensen's role in p1800 body production as quaintly positive, when their quality control was actually so poor that Volvo took their contract from them before the agreed upon number of cars was even finished. I have no idea what you're gabbling about but I do like the idea of a nefarious (as opposed to...?) protein named after me! And I'm afraid to ask, but why is Oregon bad? Because it's far away from you so that you can't really consider buying this car? Or are you just angry at Oregon for no particular reason? All-and I mean ALL-the good car candy is on the left coast. Sorry to hear you feel that way. Road trip! I know I'm being a right jerk here but since when is Missouri on the left coast? I screwed up the link. Repost. MotoExotica is a notable exception, I grant you. Plus, 25k. No, I mean those random examples of cool-but-forgotten/exotic-yet-still-affordable/unique-and-questionably-made-yet-not-yet-rusted-to-earth automobila which 99.999% of my fellow Floridians couldn't be threatened with their own lives to care at all about, let alone save from either 1) a final chapter served as fertilizer for west Okeechobee sugar fields or 2) a short trip across the Caribbean Sea in a dank shipping container. Broad stereotyping there, I'll admit. These gems just seem to turn up like bad pennies out west. It's not fair and I'm just stomping my feet. I don't agree but a man should be allowed to attend his own pity party if he so desires. No pity party. And you don't have to agree; facts is facts, brother. There are ample examples of truly interesting cars spanning the spectrum of genres all over the United States; proving this takes 6.2 nanoseconds on CL. Now, granted, these are the lower hanging fruit, representing a price to opportunity/accessibility ratio that favors guys like us who aren't afraid of turning a wrench and enjoy the chase. There's absolutely no arguing that SoCal is the mecca of cars. But I think you may be confusing what you're labeling irony as depression (wiki search "humor"). Ha ha ha ha! I just got an email from a friend telling me to SHUT UP and let you believe what you're blubbering about so that there are more cars for us in the Midwest and on the East Coast. So...you're RIGHT, absolutely positively 110% right (that's even more than 100%! ), there are NO cars in that part of the country that are interesting or worth buying. None, zippo, nada, zilch. My mouth is shut on the topic because I don't want my enthusiast friends accusing me of encouraging "outsiders" to buy our local cars. Of which there are NONE. And there never were any. Nor will there be any in the near or distant future. Ever. I swear. That's it, K2: I am committed to making my next car purchase from your backyard! I've been at DT for a few years now and I don't take myself too terribly seriously (sarcasm/irony/humor/whatever you want to call it). I enjoy the banter with us, K2. Estamos simpatico. You made my day on so many levels you don't even know, Doctordel. I learned what a prion was, for one! That's super cool in my book. I love learning new things!!!!!!! Holy moley, I met somebody new today and during our discussion the word prion popped up!!!! I kid you not. I've always loved these. They're nothing special mechanically, just the GM UK equivalent of the Vega underneath, but I've always loved them, and they're - for instance - way above a Lancia Fulvia on my bucket list. Alas, this one's the wrong year, with the big bumpers. I will note that I've seen a couple JHs with LS1 swaps and the darling little pushrod thing slips in there like the car was made for it. 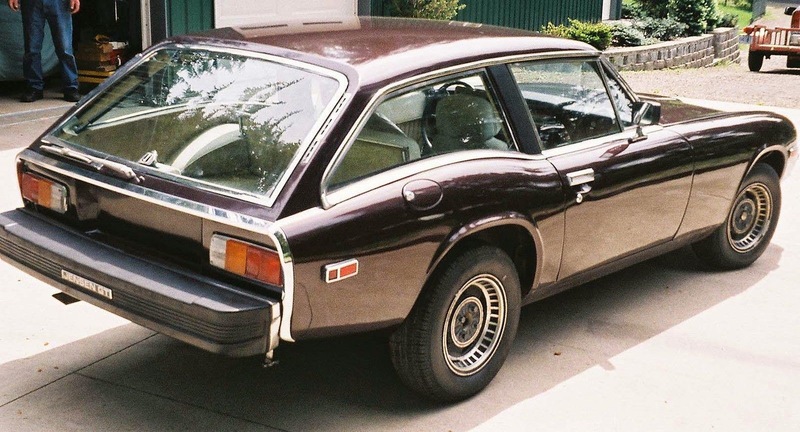 I cant remember ever seeing even pics of these and I thought of myself as a shooting brake wagon kinda guy. I'm surprised its not sold already at that price! Like the Lotus Europa front view in the sellers first pic. I could get down with this machine real easily. Its already a manual car and an LS1T56 swap would be easy peasy, even the 4.8, 5.3, 6.0 LS truck motors are silly cheap now and simple to beef up to LS1/LS6/LS2 power. This car is super cool, it needs some work but man it seem all there. I'd redo probably all of the wiring with a junkyard/wrecked Camaro to keep it fresh and modernized. Very unique ride, hope it goes to a good new home. Wish it was closer to WNY!